It had been a number of months since my last backpack so I was keen to get out on a weekend walk. As it had been pretty much exactly a year since my last walk on the Offa's Dyke Path I decided to return to it. Therefore this morning I jumped on a train to Shrewsbury, where I picked up a few provisions before taking another train on to Welshpool. It was sunny and warm for the time of year as I set off walking from the station at around 10am. The footpath I had planned to follow seemed less than obvious from the road so I instead followed the B4381 & B4388 roads for an extra kilometre. 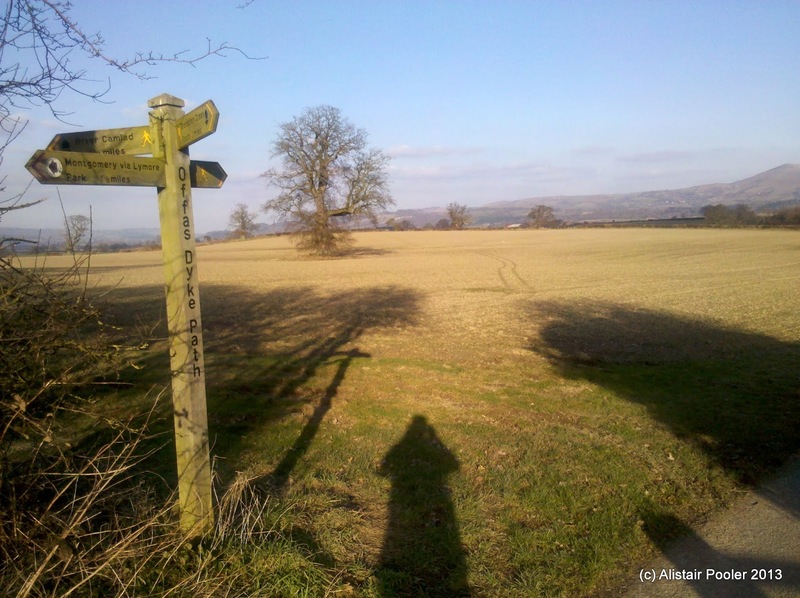 Then I was able to cut a corner using a public footpath before eventually rejoining the Offa's Dyke Path. A steep ascent through fields followed as I began to tackle the only significant ascent of the day. After a kilometre or so the angle eased and I soon entered the woods past a large radio mast. 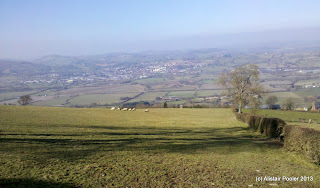 A few hundred metres further on I left the woods and found a sunny bench with a view down to Welshpool. It seemed rude not to stop here, so I had a slightly early lunch of wraps and Pyrenean mountain cheese! After feeling suitably refreshed I headed deep into the woods, in the enclosure of the Beacon Ring Hill Fort, in search of the highest point of the hill. Soon I found the trigpoint and the nearby summit of Long Mountain - Beacon Ring (Marilyn). Heading southwards back out of the woods, I rejoined the Offa's Dyke Path and gently descended to the SW before heading into the woods of the Leighton Estate; here I met my first other walkers of the day. On the edge of the village of Forden I picked up the Offa's Dyke itself for a few hundred metres before returning to the road. After almost a kilometre of road walking I turned off down a farm lane to pick up the dyke again for the remainder of the day's walking. After crossing the Camlad river, the dyke marked the England/Wales border for the next few kilometres with the path often switching sides, and every time I crossed into England there was a sign welcoming me to Shropshire. 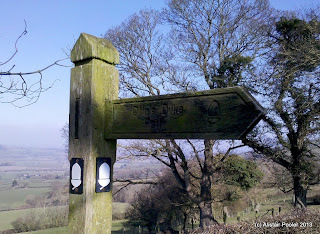 I choose not to detour from the Offa's Dyke Path to visit Montgomery due to lack of time, and instead continued southwards along the edge of Lymore Park to eventually reach Brompton Crossroads and The Blue Bell complete with some rusting old petrol pumps outside. My overnight halt lay a further kilometre or so along the trail, so I continued southwards through the pleasant Mellington Wood, where there were carpets of snowdrops next to the dyke. 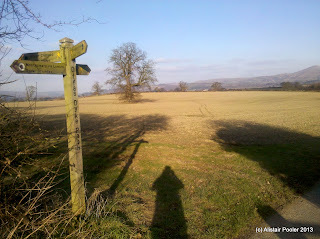 Soon afterwards a track crossed the dyke, with a sign inviting walkers to visit the restaurant at Mellington Hall. After detouring southwards for a few hundred metres to investigate the start of tomorrow's route, I returned to this track and followed it to the Mellington Hall campsite where I had arranged to pitch my tent for the night. I arrived at the campsite around 5:15pm and found the reception closed, but I eventually managed to find the camping area and set up my tent in the last light of the day; I was the only person camping that night, presumably due to the time of year. I had an early start planned for tomorrow so after dinner I left my camping fee outside reception, returned to my tent, had a wee dram and went to bed shortly after 9pm after a good day's walk. We did the ODP to here from the south a few years back, and enjoyed every minute. We finished at Churchstoke after starting at Knighton - some 17 miles over the switchbacks - tired and in need of food. Memorable, though! BTW, we've had a drink in the Blue Bell quite recently. An odd place, for sure, but interesting in a 50's throwback/time stood still/fizzy beer served in lampshades/museum-piece kind of way. It was indeed a nice day; in fact I wish it would be that warm this weekend! The switchbacks were quite tiring, especially I was walking against the clock to ensure I got to Knighton in time for my train! Thanks for the info on the Blue Bell; I would have liked to have gone in - I'll have to visit again during opening hours.